Dr. Man Mohan Sundria was born on 15th November, 1976 at Village- Sali, District-Jaipur in Rajasthan. Dr. Sundria obtained his Masters (2000) & Ph.D. (2004) Degrees from Rajasthan College of Agriculture, Udaipur. He joined the University service in July 2005 as Assistant Professor and has experience of more than 12 years in different areas (Research, teaching and extension). He worked at KVK, Keshwana, Jalore and ARS Mandor. Dr. Sundria has developed & refined more than 15 Plant protection techniques and published 19 Research papers, 5 booklets and 10 popular articles, 3 book chapters on different entomological aspects. He has visited Memphis, USA in 2012 for attending “Seventh International Symposium on Integrated Pest Management” by University of Illinois (Urbana-Champaign) at Memphis, Tennessee, USA. He also visited Germany for exposure of various R&D institutes, laboratories and University situated at Berlin, Frankfurt, Hannover and Bonn in Germany. 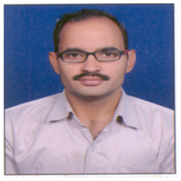 Dr. Sundria is Life members of Entomological Research Association, Udaipur, Indian Society of Oilseeds Research, Hyderabad and Arid Zone Research Association of India, Jodhpur, Sesame and Niger Workers Association, Jabalpur and Association of Administrative Staff of College, Hyderabad. He has got two best poster presentation awards in workshop and symposium organized at Jodhpur and Bikaner, respectively.